Last summer, I made Hannah Kaminsky’s Butterscotch Bars, from her book My Sweet Vegan, and I loved the blondie taste. Deliciously sweet, with a vanilla aftertaste and spiked with chocolate chip morsels in every bite. 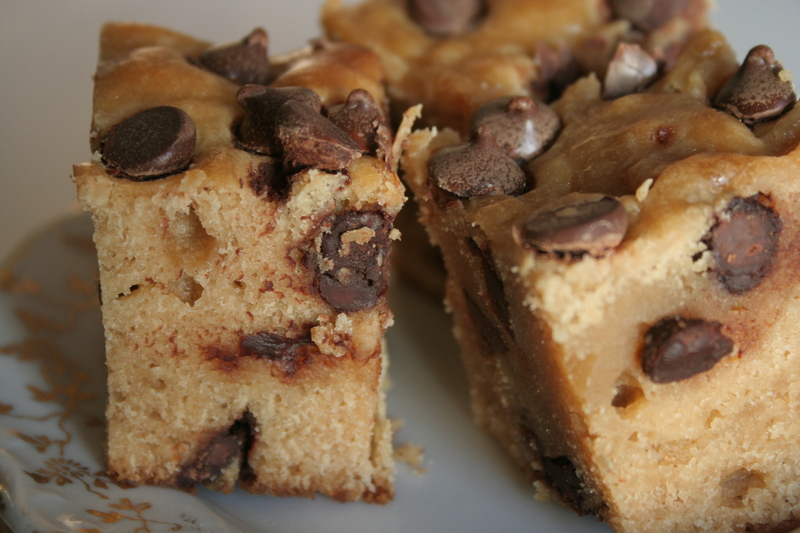 I made them again this summer, but with one change: Last time I made them, these blondies were cakey and fluffy – I was looking for something more fudgey. So, this time, I left out the baking powder in the recipe, and they came out perfectly. Not too dense, but with a more brownie-like texture. 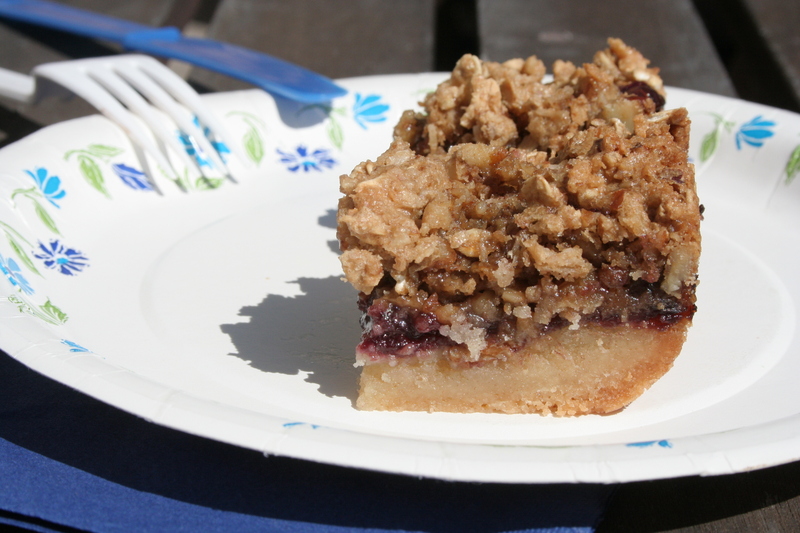 Summer is definitely here, and brownies and blondies are calling my name, to be ready for all the picnics I plan on going on during these beautiful blue-sky worry-free days. I can’t wait to try all of Hannah’s blondie recipes from her new(ish) ebook! My friend Sari and her mom have made these bars for years – they are always the hit of every party, and a staple at their family’s Hanukkah parties. I personally think they are great for any function, but recently they have struck me as a perfect picnic dessert! These bars are easy to pack and carry (they travel well), and they have such a summery flavor! Take them on a picnic, platter and serve them at your next fancy gathering or tea party, or eat them for plain-old-dessert or even as a snack! You won’t be able to resist the sweet raspberry jam sandwiched between the rich buttery bottom crust and the crispy crunchy topping. I made two versions of this recipe – one was gluten-filled, and the other was gluten-free. The recipe printed below uses regular wheat flour. However, I have listed the gluten-free flour substitutes below, and if you use the ratios that I recommend, then you will end up with a delightful version that will make any tummy happy. Both versions tasted the same, but the gluten-free version bottom crust was a bit more crumbly than the gluten-filled crust. The bars still held together well though, so no worries! Mix 2 cups flour and sugar. Cut in the Earth Balance until it is crumbly. Kneed in bowl until fully combined. Pat dough in an even layer into an ungreased 15×10” pan. Bake until light brown (about 15-18 minutes). Spread jam over slightly warm crust. Reduce oven to 325º F.
Beat brown sugar, egg replacer, and vanilla until light and fluffy. Add nuts, coconut, flour, oats, baking powder, and salt and stir. Bake until top is brown and center is firm to the touch (about 35 minutes). Let pan cool and firm up, then slice into squares to serve. Divinely moist and rich, these brownies are fantastic! They are from Peter Berley’s The Modern Vegetarian Kitchen, which a friend recommended to me months ago and I hadn’t even cracked open until now. What was I waiting for?! After baking these bars of chocolate heaven, I will definitely be utilizing Berley’s cookbook more! If you want dark, gooey, intense brownies, make these. With their crispy top and dense middle, they will satisfy any chocolate lover’s sweet tooth. If you’re looking for a gluten-free version, my absolute favorite brownie recipe is Hannah Kaminsky’s – but these ones come in at a close second. Rice Crispy Treats hold specific childhood sensory memories for me, and probably for a lot of adults as well. This sticky, sweet, crunchy, crispy, gooey, on-the-go, lick-your-fingers-afterwards, all at the same time experience is what childhood was all about. I got this recipe for a similar treat from my friend Marjorie awhile ago, and hadn’t had quite the right reason to make it till now. Brown rice syrup is much easier for your body to process than the cane sugar and additives that are in most baked goods. Since these rice crispies are stuck together and sweetened with the sweet syrup, they are a much healthier version than the traditional marshmallow dessert. However, these bars definitely don’t taste exactly like the marshmallow version; they aren’t as sickeningly sweet and they have the added tart flavors of dried fruit and the crunch of seeds, as well as the salty nutty taste of tahini. They are not kid-friendly in this sense, unless you have a particularly adventurous child. This was lucky for me, as Marjorie used to make these and her kids wouldn’t want to eat them, so there were always some left for me to snack on! I would want to devour the whole container while I was at her house, but I’d hold myself back and enjoy these simple flavors and textures slowly. It’s very simple and nutritious – it’s one of those treats that is actually pretty healthy, although you do have to remember it’s a treat still, so you shouldn’t eat too much at a time…It was a perfect treat to take on a hike; it was a bit like an energy bar because it had all the necessary proteins and carbs to give us strength and energy to keep going, it was light and easy to pack and carry, and it satisfied all our sweet and salty cravings. And it was quite filling too! You can make it with whatever dried fruits you like best (I think that currants, apricots, raisins, or dried apples would taste delicious) and whatever seeds or chopped nuts you want to add would work too. While I just used crispy brown rice cereal as my base, you could throw in a combination of puffed rice, puffed millet, and puffed rice as well, as long as it equaled the same total amount. It’s a very adaptable recipe. This recipe makes 2 dozen squares. In a large pot, heat oil, rice syrup, and tahini; stir until bubbly. Remove from heat and stir in vanilla. Add remaining ingredients, mixing well with a wooden spoon. Spoon mixture into a 13×9 inch pan and press flat. Allow to sit at room temperature until set. Then, cut into squares and store in an airtight container at room temperature. Now, I know you all know about my peanut butter obsession. I put it on nearly everything. But one thing I hadn’t combined it with before was brownies. Of course I’ve combined it with chocolate (in cake, cupcakes, and in ice cream), but not in chewy fudgy brownie form. Truly Appalling. I immediately set out to remedy this awful fact. I looked at endless recipes online and in my large vegan cookbook collection, tried to come up with my own favorite brownie recipe, and worried over how I would add the peanut butter – it could be fully incorporated into the brownie batter for a double-whammy rich gooey brownie, it could be a completely separate layer on top (cake-like? a heavy frosting? ), or I could swirl it in to partly incorporate it. After many nights staying up way too late obsessively researching vegan brownies, I realized I had the perfect Peanut Butter Swirl Brownie recipe right in front of me the whole time. Lois Dieterly’s Sinfully Vegan is a never-fail cookbook that has many types of brownies in it, and low-and-behold, she has a Peanut Butter Twist Brownie recipe! They are easy and the prep work goes quickly. I was especially impressed that this recipe doesn’t call for any oil! Dieterly has subbed applesauce into the batter, and the brownies still retain an incredibly rich and chewy texture. I know they have peanut butter on top and plenty of sugar in every layer, so they are not void of fat, but the applesauce made me feel like they were a little healthier…And they certainly satisfied my chocolate-peanut butter fix. The peanut butter mixture gets swirled into the brownie batter so it is somewhat incorporated, but still leaves a lovely sweet peanut butter layer on top after baking, so you can taste all the parts on their own. I changed the recipe very slightly because I didn’t want to use tofu. I’ve printed my adapted recipe below. Preheat oven to 350 F. Coat an 8×8-inch square baking dish with nonstick cooking spray. Stir together granulated sweetener, applesauce, and 2 Tablespoons water in a medium size bowl. In a small cup, mix ground flax seeds with 1/2 cup water. Add to applesauce mixture and stir to combine. Add vanilla to this mixture. In another small bowl, combine flour, cocoa, baking powder, and salt. Add applesauce mixture to flour mixture. Stir just to combine and pour into prepared pan. Place peanut butter, maple syrup, and flour into a blender or food processor. Process until smooth. Drop by spoonfuls onto brownie batter. Using a knife, swirl the peanut butter into the brownie batter (be careful not to mix completely). Bake for 40-45 minutes for chewy brownies. I recently made these Caramel Pecan Bars that I had been drooling over for the last few months. I saw them on Kristen’s site and just couldn’t get over how delicious they looked. They have a pecan cookie bottom with a thick gooey caramel layer over it, and crushed pecans sprinkled over the sticky top. I drizzled lots of chocolate on top of my bars, because I happen to think that caramel and chocolate are best when paired together. 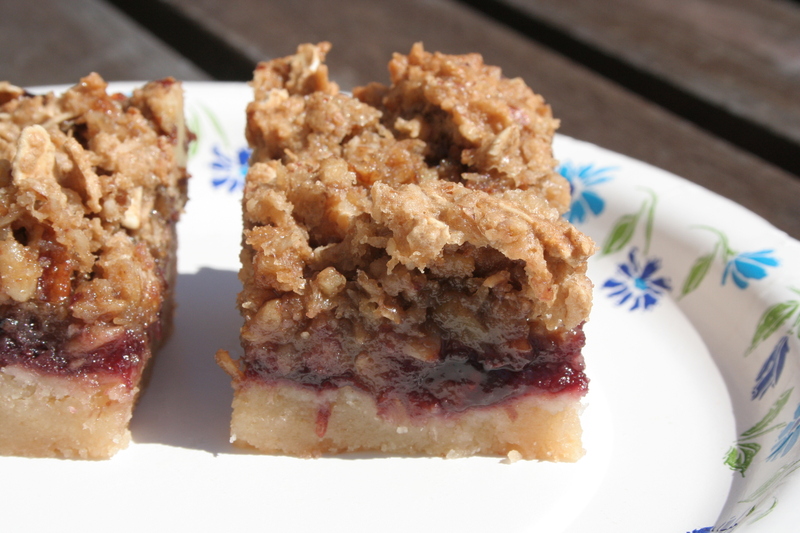 These were great bars, and I whole-heartedly recommend the recipe! The only thing is, when it came time to cut my bars into pieces, the caramel was very difficult to cut through; they were too sticky and hard, so while I didn’t get a nice even cut the way Kristen did, I certainly got an arm workout! Perhaps I cooked the caramel too long so it got too high in it’s “firm ball” range and closer to the “hardball” stage? I was trying to be very careful with temperatures, but it’s possible that this was the problem. In any case, the bars were rich and tasty, and the soft cookie bottom was a great contrast with the chewy caramel and crunchy pecans. Vegan candy bars are often hard to find. Tara and I really wanted to make something that would fulfill our sweet/salty/chocolate/chewy/crunchy needs, so we thought a lot about how to create those flavors all in one candy confection. Though small, these candy bars packed a punch, and definitely were worth all the work we went through to put them together! Next time, I will try to find a mold in the shape of a rectangular chocolate bar, so that our finished product looks more smooth and precise. However, the handmade shapes we created were fun and original, even if somewhat gloopy. We made two types of candy bars. We had gone through all combinations of flavors, and drawn out diagrams of how each candy bar would be built. Some were simple, others were incredibly complex with layers and layers of wafery-thin cookies and balls of peanut butter and some sort of vegan nougat that we never quite figured out how to make. Eventually we abandoned these complex plans and decided to fulfill our intense Snickers needs…One of our candy bars started this way, and so it had a home-made shortbread cookie bottom with gooey caramel and salty peanut filling layered on top. We covered the whole thing in dark chocolate. After the chocolate set and hardened, it had a great crispy outside shell and the caramel was nicely stringy and chewy. The salty-caramel combination was devine! Our second type of bar was also delicious. We sandwiched layers of almond marzipan, dried cranberries, and pistachios between two thin shortbread cookies, and covered the entire sandwich with rice-milk based white chocolate. Drizzled with dark chocolate and sprinkled with pistachio pieces, this was a sweet confection that blew my taste buds, and was very pretty! Each bite made me want more.